I had hoped to have this review out in time for the launch of the fourth book in the Brimstone Angel anthology, but I had forgotten how long it takes me to read epic fantasy. It is not a bad thing, just a misjudged timeline on my part. These novels are so engrossing and take you on such a fabulous journey. And you can't rush a journey. The previous book was largely courtly intrigue and relationships. We were in the human lands of the Forgotten Realms. Most of the characters and cultures were familiar. Farideh and Havilar created tension by being the odd people out and made a fun novel to read. This novel we gear towards mystery and politics when an entire group of youngsters comes up murdered. All of this is happening in Djerad Thymar with the Vayemniri. And all 30 years after Mehen was exiled. Now Farideh and Havilar aren't the odd faces out, but there is still tension to move the story forward. While this is a series of stories around the greater mystery of the Brimstone Angel (and what in Infernal is she up to? ), each individual novel has a new and fresh feel. The faces are the same but the places are different each time, and that gives the characters depth. They must react differently and grow according to their surroundings. The love issues are there developing along with the characters even if it isn't as prominent as the last novel. We especially get to see growth with Dumuzi and his struggle with the Vayemniri versus gods culture. I have fallen in love with the fantasy genre even more because it has grown so far past elves and dwarves. The dragonborn aren't human so they shouldn't have a human history. The author makes an ethos here. She builds them a history. Then that history gives a tension worth reading and thinking about. I am never bored by what I read in the Forgotten Realms. The whole process can be slow going, but they are never boring. I just wouldn't recommend picking this up if you are looking for a light weekend read. I do highly recommend them if you are looking for something to delve into that other world, that escape from the daily grind for a little bit each night. 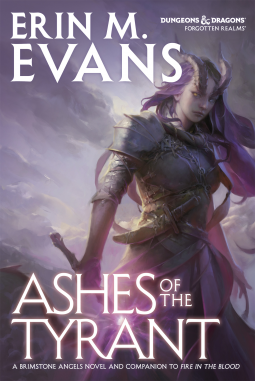 Four stars to Ashes of the Tyrants because I liked Fire in the Blood better.